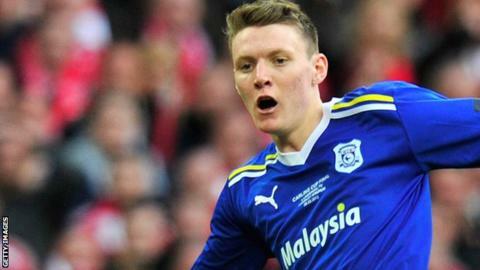 Cardiff City striker Joe Mason has agreed to extend his contract with the club until 2016. Mason, 20, joined the Bluebirds from Plymouth Argyle in 2011, initially signing a three-year deal for an undisclosed fee. The Republic of Ireland under-21 international has scored 11 goals this season to help bring Cardiff to within reach of a play-off spot. He also scored against Liverpool in the 2012 Carling Cup Final. Mason, who has recently been linked with Premier League clubs, is the latest Cardiff player to commit his future to the Bluebirds after fellow striker Rudy Gestede signed a two-year contract extension this week. Cardiff boss Malky Mackay said he was delighted to agree a four-year contract extension with Mason. "He's another one that's young and has got potential and one that we feel has got a good future if he keeps working hard and keeps learning," said Mackay, whose side can secure a play-off place with victory at home to Leeds United this Saturday. "He's probably had to play more games this season than he thought he was going to play but again, I'm not one to hold back someone if they keep advancing, which he's done. "He's a bright footballer and it's why the rest of the players give him the ball because they know he can handle it and can be calm and collected in high pressure situations. "Again it's something he keeps learning, it's his first season in the Championship and if he keeps working hard and applying himself, he'll go from strength to strength." The 20-year-old striker's form could see him called-up to Giovanni Trapattoni's Republic of Ireland side for this summer's Euro 2012 tournament in Poland and Ukraine. And Mackay believes the forward would flourish on the international stage if he were to receive his first senior cap. "He wasn't phased going into the Carling Cup Final in front of 90,000 people," said Mackay. "I think young players enjoy playing football, enjoy testing themselves and enjoy new challenges. "Why would you not want to be going to the European Championships?"